He has gone above and beyond the 20 pound mark. He is crawling from room to room - no big deal. He pulls himself to standing position. He tries to pull himself onto the ottoman (almost succeeds), looks for me and then bursts out laughing. He cruises from the ottoman, to the sofa, to the chair and then around again. I predict walking within a couple of months, but we'll see. I am especially loving watching his personality grow right now. He is still so happy and I hope he's always this way. He rarely cries, even when he falls down (which is a lot while he's learning to stand on his own). He just picks himself back up and tries again. I seriously hope that attitude translates into adulthood. I love this boy to the moon and back. And his hair is still red. Yessssssssss. I love the cheerio stuck to his chin. So beautiful! What a cutie! I love his red hair and dark eyes. I can't even tell you how happy I am that you are going to be here for my shower. Its changed to the 25th, thats a Friday night. Anways, can't wait to catch up soon! 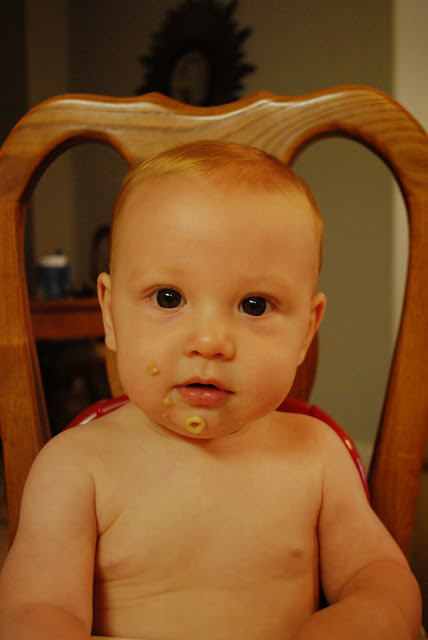 Parker has a picture EXACTLY like that--cheerio stuck to his chin and all! ha ha! Must be a boy thing! he is so cute. that is so crazy he is already trying to stand on his own. he is a fast learner! i love his hair.